​An adequate highway transportation system is critical to the success of Texas real estate markets. The primary funding mechanism for decades has been revenue from state and federal fuel taxes. Currently set at 20 cents and 18.4 cents per gallon, respectively, neither has been increased since the early 1990s. Furthermore, federal transportation funds remitted to the states from the Federal Highway Trust Fund have remained “iffy” because of persistent short-term extensions to previous transportation bills. 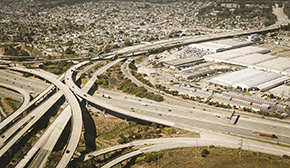 A new long-term federal highway bill known as Fixing America’s Surface Transportation Act (the FAST Act) was signed into law on December 4th, just before the latest extension was set to expire. Governor Greg Abbott made increased transportation funding a priority during the most recent legislative session, including it as one of his five emergency items for the legislature to address. The result was passage of several new laws that focus on increasing the revenue available for Texas roads in the years ahead. A summary of the pertinent legislation follows. One important thrust of new transportation legislation involved reducing the state's future use of toll roads. "The legislature got more public pushback on toll roads this past session than ever before," says Steven Polunsky, research scientist at the Texas A&M Transportation Institute. "The main concerns were that toll roads be self funding and that their cost is accurately calculated up front." House Bill (HB) 2612 requires the Texas Department of Transportation (TxDOT) to provide a report to Senate and House Transportation Committee members no later than September 1, 2016, concerning the removal of tolls on most toll projects in the state. propose a plan to eliminate all state toll roads, which does not include toll roads constructed, operated or maintained solely through funds from bonds issued by other tolling entities such as counties, regional mobility authorities (RMAs) and regional transportation authorities (RTAs). TxDOT's network of toll roads includes the Central Texas Turnpike System (CTTS) around Austin, the Camino Colombia Toll Road (SH255) near Laredo and several segments of the Grand Parkway (SH99) in Harris, Montgomery and Chambers Counties. "HB 2612 was meant to provide a reckoning of tolls and toll debt," says Polunsky. "Exact figures have been difficult to come by in the past." Another toll-related bill, HB 122, prohibits the issuance of any new debt out of the Texas Mobility Fund (TMF) for toll roads. Authorized by Texas voters in 2001, the TMF allowed TxDOT to participate in the payment of construction costs for publicly owned toll roads and other public transportation projects through the funding of bonds. TMF revenues are now restricted to retiring toll-related debt and renewing or replacing any existing credit agreements that involve variable rate obligations. In FY 2014, the state spent more than $359 million from the TMF on debt service alone, nearly half the $730 million it spent on transportation projects and maintenance. These two bills focused on increasing direct payments for roads. 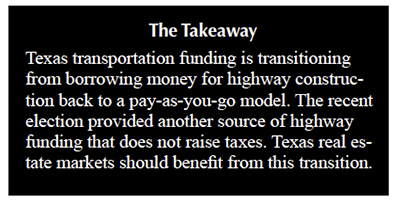 The intent was to facilitate an eventual return to traditional pay-as-you-go highway funding in Texas. In 2013, the 83rd Legislature passed Senate Joint Resolution 1 (SJR1) that led to the passage of Proposition 1 by Texas voters in November 2014. This constitutional amendment diverts half the money that would be deposited into the state's Rainy Day Fund to the State Highway Fund (SHF). The objective was to increase state highway funding without creating any additional tax burden. 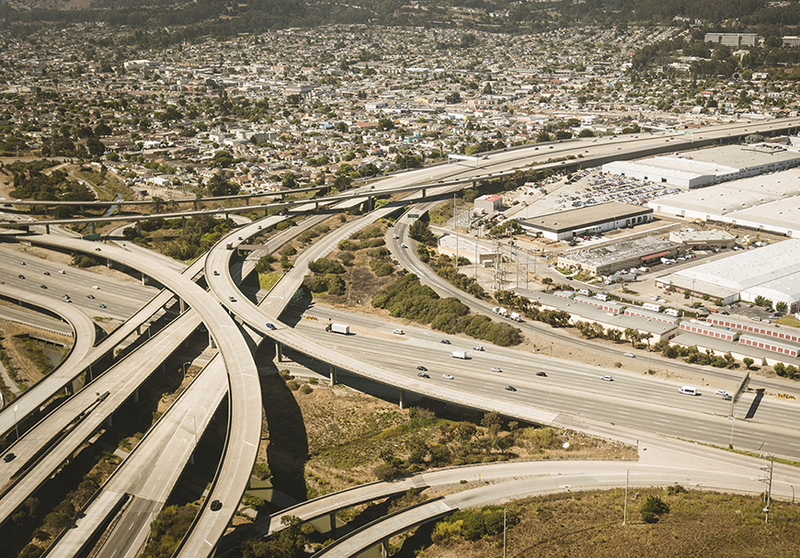 The expectation was that Proposition 1 would increase transportation funding by about $1.2 billion per year. The SHF actually received about $1.7 billion in the 2015 fiscal year from significantly higher oil and gas severance taxes. In the most recent session, the Legislature again chose to increase transportation funding without implementing any new tax burden by passing SJR5. The joint resolution put Proposition 7 up for a vote on the November 3rd ballot. Proposition 7 passed handily with 83.9% of the votes cast. TxDOT has stated it will be the largest annually recurring infusion of transportation funding in the state's history. "The jewel in the crown for future transportation funding is Proposition 7," says Polunsky. "Starting in fiscal 2018 and 2019, TxDOT could receive an additional $2.5 billion a year from the state sales tax. By fiscal years 2020 and 2021, revenue added in from the motor vehicle sales tax could increase the amount to about $3 billion a year." Specifically, Proposition 7 will require the comptroller to deposit into the SHF up to $2.5 billion of net revenue exceeding the first $28 billion collected from the state sales tax each fiscal year. The funds will go to TxDOT through 2032. Proposition 7 will also require the comptroller to deposit into the SHF 35 percent of the net revenue collected from the sale, use or rental of motor vehicles that exceeds the first $5 billion coming into the state treasury in that fiscal year. TxDOT will receive the funds through 2029. The legislature, by a majority of members in each chamber, may extend either of the expiration dates of these two provisions for ten-year increments. These funds are not insignificant, considering TxDOT's total funding for the fiscal 2016–17 biennium is about $23 billion. HB 20 was passed to bring more transparency and accountability to the funding process. The bill requires the creation of a scoring system for prioritizing transportation funding. It also establishes House and Senate Select Committees on Transportation Planning to review, study and evaluate transportation funding, project selection, prioritization and performance. "HB20 is a major retooling of how transportation projects are chosen and carried out," says Polunsky. "It calls for using performance-based measures in decision making, pulling in local planners and decision makers into the development of those criteria." The bill also ends a $1.3 billion diversion of transportation funds that had been going to state agencies other than TxDOT. Affected agencies include the Department of Public Safety, the Department of Motor Vehicles, the Office of the Attorney General and several others. The comptroller recently lowered his forecast of state tax collections by about $4.6 billion with the recent downturn in the state's oil and gas drilling activity. The latest projection is expected to reduce the Proposition 1 allocation from the Rainy Day Fund to transportation by about $685 million. Proposition 1 should add about $1.1 billion to the SHF during the 2016 fiscal year, an amount not significantly different from the comptroller's original estimate. However, funding is now being forecast to drop to about $600 million in the 2017 fiscal year. The $1.7 billion collected in 2015 from Proposition 1, about $500 million more than expected, will temper the effects of the predicted lower payout in 2017.